I knew I shouldn’t have waited so long to wrap up the account of my trip to Mata Ortiz Mexico! So much has happened over the summer. And I am squarely into the fall and all Fall Craft Markets! Thank you so much to everyone who joined all of us makies at the Make It 10 year anniversary craft market at the Croatian Centre in Vancouver last week. It was so much fun. And really nice to talk to many of you. 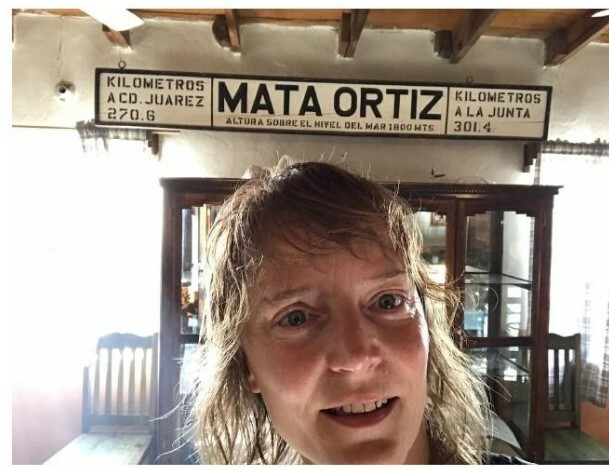 One of you even commented on reading about my trip to Mata Ortiz! I love it! 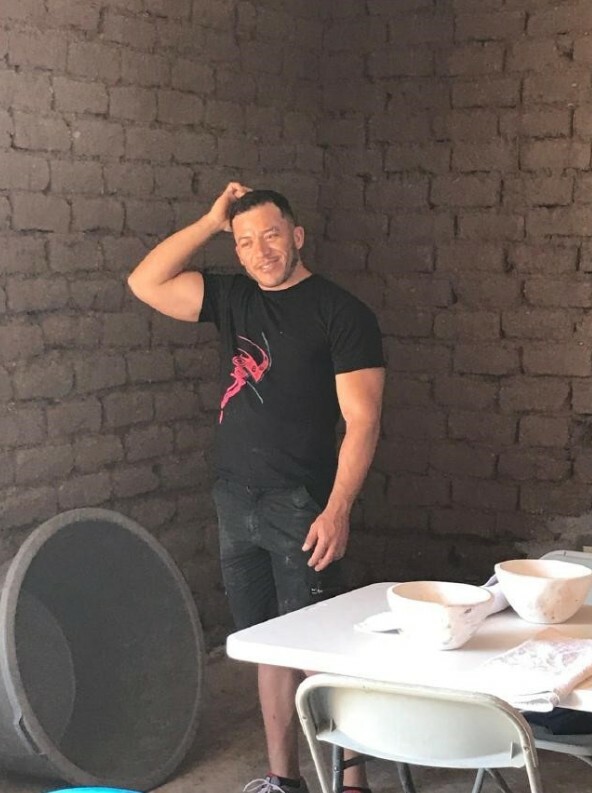 When I last wrote I was building a pot in the beautiful mountains of Chihuahua, and we had learned where to dig and how to process the amazing clay of Mata Ortiz. Next comes the really interesting part; learning how the distinctive finish of the Mata Ortiz pottery is created. The teacher Diego had another potter in town make several pots that were already dry – also known as ‘bone dry’. We learned the finishing technique on these already made pots. The reason for this was a few fold. Firstly, our pots would take a few days to dry, and we simply did not have time to wait. Another reason is because if there is as much as a tiny air pocket in a pot, it could explode in the firing (baking) of the pot. Not only destroying your pot, but anyone else’s nearby! As this was the first time many of the workshop participants had ever worked with clay, the chances of no small air pockets may be considered optimistic. And, why not have us work on a nice smooth ‘canvas’ while passing the love around the whole town by buying the ‘Greenware’ (un-fired or not yet baked clay) from another local potter. We started sanding. Yup, with just regular sandpaper. First course, and then finer and finer grits, until the pot was absolutely egg-shell perfect. Green ware is very VERY fragile – so the process is very calm and meditative. It is very like sanding, or caressing, without cracking, a hollowed egg shell. Again, a day passed with the cadence of musical Spanish, this time with the rhythmic swish of all of us sanding our beautifully shaped egg like pots. When the pots have been sanded to the very finest grit, the pots are oiled. Diego used furniture oil, but basically any thin mineral oil would do. The pots are left to soak up all the oil, until they look ‘dry’ again. Then more oil, and again dried. After that the polishing begins. 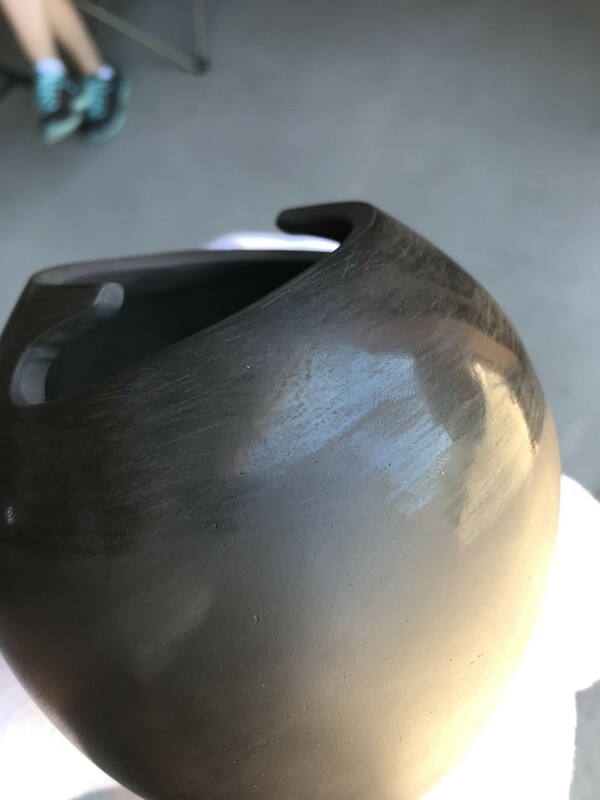 A small dab of water on the surface of the clay, and at just the right amount of dry but still a little moist, the pot gets polished with a very smooth stone. This happens in very small patches, because if you wet too big of an area, you cannot get it polished before it dries to much. Dab water, polish. Dab, polish. This process is called ‘Burnishing”. Wis polishing or burnishing of the pot almost negates the need for glaze. (The glaze is the glassy coating most of us are used to seeing on pottery. It literally is glass and minerals melted onto the clay pot). In Mata Ortiz pottery the pot is not glazed, its sheen is very highly polished clay. This is a very tedious process. But it cannot be skimped on. If you polish unevenly, it will show in the final finished piece. And even our warm fingerprints could scratch the highly polished surface! We were each given a piece of very soft flannel to hold our pots with so we never touched it with our bare hands. Ever, again! Whew! Wow! I thought I’d have this trip to Mexico down on ‘paper’ in 3 parts! No way! Next part will be about the decorating, or painting the distinctive patterns on our pots. And then the exciting firing process. Again, Thanks so much for your interest in my pottery! I’ll definitely be at the Make It sale in December. But I’m pretty sure I’m going to be at a few other sales between now and then. Stay tuned! You can always find my work on my online store HERE. 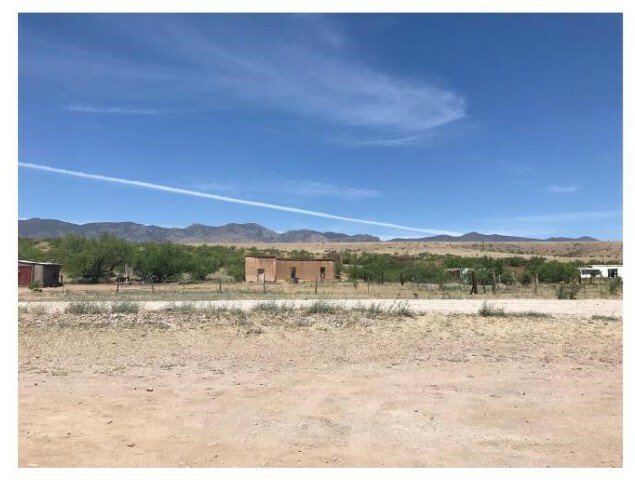 In the first part I had written briefly about how I found out about Mata Ortiz and Diego, how I got there, and a little about about the history of the pottery of the area. Next Ill speak a bit more about the workshop itself and how the pottery is made. Each morning Diego either picked me up, or had one of the other participants of the workshop come and fetch me. Eventually, at any rate. There is definitely a different sense of timing in Mexico. I had been forewarned about this, so I was somewhat prepared. What I was not prepared for was my complete inability to be NON-punctual. Which meant that no matter what I was dead on time, and waiting. Now I was happy to wait, because as I said before, I was expecting ‘Mexico time’. But I think I made people uncomfortable. I really do need to learn to chill out. But that is a whole other topic. The actual workshops took place a few miles further down a dirt road, in a gathering of about 5 houses, a church and a school room – a ‘town’ called Santa Rosa. The property is three un-plastered adobe buildings. One was the childhood home of Diego’s. The other was a neighbors house that he bought. And there was a third smaller, but taller building, that I think may have originally been a barn and hay loft. These buildings bordered on the green strip of the dry river, and was towered over by the El Indio mountain. Diego bought up these buildings, fenced and gated them together (all of the houses here are fenced and gated). 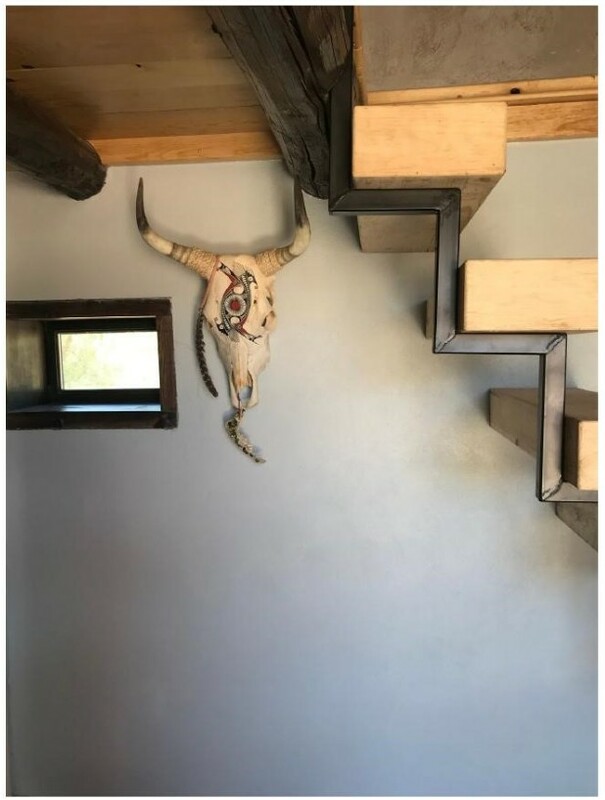 He and his family rebuilt the small barn first, creating a cool and beautiful space for the necessities, washroom and seating areas. Next he poured new concrete floors and put a new roof on the home he grew up in. This becomes the main studio room. On the roof is a gravity fed water tank, and an ingenious sort of solar power system; heat of the sun boils water in tubes on the roof and creates steam to generate power. How cool (hot) is that? The other buildings are yet to be finished. The eventual plan is for there to be a place for workshop participants to stay. We spoke about how he was trying to preserve as much as he could, while also having all of the modern convinces. I am a bit of a geek about building and building techniques – as my mum is in architecture and engineering. I really loved hearing about how he saved the hundred year old wood beams, reinforced a collapsing wall, or the plans for reclaiming the old wood doors. When all of the other participants gathered, I saw this was going to be different from any other workshop I had done. Two of the participants were tour guides in nearby Casas Grandes. They gave tours of the museum that focused on the Paquime and they wanted to learn more about how the pottery was made. One person was a photographer, and I think, a friend of Diegos. There was a housewife who just wanted to try her hand at pottery. There was one other potter besides me, who was actually from Mata Ortiz. She makes and sells lots of work, but in a different technique than what Diego uses. She buys her green ware (un-fired) from other potters. What that means is that she decorates pots made by someone else by scratching patterns into them. Diego knows how to dig and process the clay, make the pots, and decorate by painting with locally sourced minerals. She wanted to expand her skills. The other thing to know is that this was the first workshop like this Diego has run. He has several others scheduled for this year. I hope that he gets many more participants. But this group turned out to be an ideal size, and the diversity of skill levels quite interesting. Neither of us potters where really any further ahead than the first timers. We sort of started a bit out of order, but it all made sense in the end. The first day was wedging clay and learning how to build a basic pot shape. The clay was unlike anything I had ever felt. It was dark deep red, perfectly smooth, and very fine bodied – not one bit of grog or larger particle. It was also very plastic and flexible while not being slumpy, retained its moisture, and almost seemed to refuse to crack. It was SO forgiving! 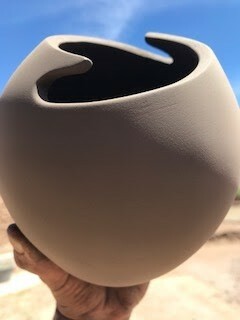 We half coiled, sort of pinched, round bottomed pots started in plaster, or ceramic bowls. And we could build the basic pot shape in about a day, using the simplest tools; a cut piece of serrated saw blade, and a bit of plastic container lid for smoothing. And hands. That’s it. So simple. This was the lesson I would be reminded over and over in the week I was there – the only tools you really need are hands and mud! Pottery does not need to be complicated or hard. Nor do you need special or fancy tools, kilns, tables, or other accoutrements to make useable and/or beautiful pottery. Day two we went out to see where the clay was dug, and how to process it. Again, so simple; shovel, bucket, water, time and strain. Simple perhaps, but not easy. The locations of the clays were a carefully guarded secret in some cases. We came to one place that two other potters where digging, at first they seemed a bit put out that we were there. I learned from one of the other participants who spoke a bit more English and can translate for me, that the med digging have done all the work uncovering this vein of clay – the arduous task of digging the hard earth and stone off of the top of the layer of clay – and they did not appreciate that others where just coming and digging up the unusual yellow clay now that it was exposed, by their labours. We dug elsewhere. We did this driving about and digging the hard earth in the early morning, arriving back at the studio for lunch. Hot and dusty. Ready to have our plain lunches and drink some cool drinks. The remaining hours was spent working on our pots, coiling up, cutting the openings, and smoothing both the outside and inside of the pots. The remainder of my day was filled with the music and cadence of the Spanish language as everyone but me weighed in on the upcoming elections. Hours of passionate dialog – civilized and thorough. Agreeing, disagreeing, agreeing to disagree, and back ‘round to another point or issue. 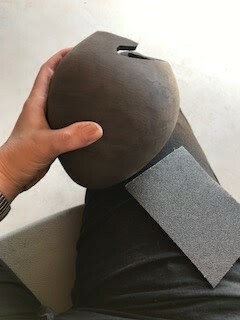 And my fingers pressing, sliding and scraping over the cool, smooth and supple clay. As I sat in the shade, looking out at the impossible blue and green of the mountains of Mexico. How did I end up in the mountains of Mexico taking a class from Diego Valles? How did I find this? And why ever would I do this? Several months back I was – let’s just say – feeling a bit lost. I had set aside some money from a lucrative, yet less than fulfilling gig. Should I spend that money on some kind of retreat? a class with a guru or yogi, someone who can help me find my path? But a close friend of mine suggested that I was more of a ‘go climb a mountain’ type, rather than the type to go to therapy, or any sort of woo woo thing. Now I don’t actually climb, or run, or anything like that. I do yoga religiously – 4 times a year – and usually regret it, until I forget it, and go again. I just don’t learn. 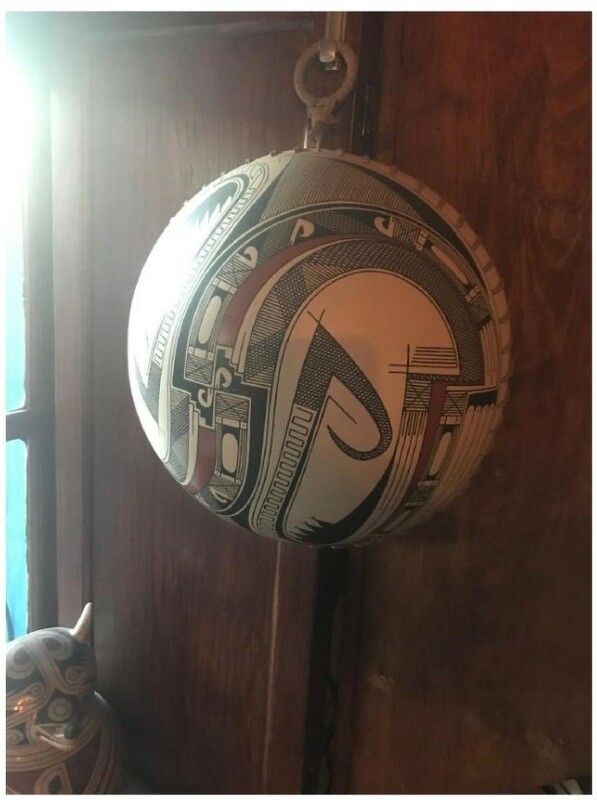 So, one of those random, late-night web serf kinda nights, I found myself looking at pottery pics, Mexican pottery, clicking through to the artists, the community, Mata Ortiz. Holy sh$% this stuff is amazeballs! I fired off a random email or two. And yes, I CAN goto this amazing place and take a pottery workshop! OK, it really wasn’t that quick, it was actually a bit of back and forth, a bit of research, buying a few books, and finally a few issues around intermittent web access. But in the end it came down to a leap of faith. Yes, I AM going to a tiny town, in the middle of a place I didn’t even know was an actual place – I only knew Chihuahua as a small rat like dog. Yes, I am going to go to a place no one I know has ever heard of to hang out with a guy I just learned about. And yes, I’m going to leave my travel arrangements up to him because I don’t speak a word of the language. This all sounds like a spectacularly good idea. I wonder why my partner seems worried? And the whole thing was better than I could have even expected! (Except when it wasn’t, and I’ll tell you about that later) Getting there was an ordeal. I will travel a different route/way when going back. (And I will be going back). AiroMexico looks great on paper. In fact it looks great in the air! The plane are awesome, service great, food good. The problem is getting into the air on any sort of time line. Delays, missed connections, changing times and gates – all fine and good if you are not traveling into the middle of nowhere and have several, and successively smaller flights. I ended up flying Vancouver to Mexico City, Mexico City to Chihuahua, Chihuahua to Monterrey, Monterrey to Ciudaz Juarez (Which by the way is right on the other side of the US/Mexico border from El Paso, Texas). I was stuck in Monterrey for almost a whole day, with no explanation from Airo Mexico. And finally 4 hours in a bus, which was by far the most comfortable part of the journey. Diego picked me up from the bus station – a one room affair, and we drove the hour to Mata Ortiz. All in all a rather long and arduous trip. Funnily enough if I had flown into El Paso it would have saved me almost a whole day travel and cost me an extra $300. Next time I’ll spend the money. Or better yet – Ill fly into Chihuahua and bus from there to Casas Grandes. Although the City of Chihuahua is f bit further away from Mata Ortiz that Casas Grandes, the buses in Mexico are so comfortable, frequent and punctual as compared to the Mexican Airlines, I’d rather spend the time on the bus than a plane. Also Chihuahua city is the capitol city of the Province of Chihuahua, so there are a lot more flights in and out. (A beautiful small town, on a green ribbon, amid the rocky mountains, built on the bones of an ancient people) So there you go… Now you know how to get to Mata Ortiz. A few other travel notes; unfortunately you cannot bring more than the tiniest amount of Maple syrup to your hosts as gifts. Bummer! I love bringing syrup, its so Canadian, and usually really appreciated. By the time I made it to Mata Ortiz I had almost turned around to go home, twice. The ‘No Exit’ like stay in the Monterrey airport with no sleep for almost 24 hours was enough to make me question my sanity. But the bus ride restored my faith in humanity all over the planet. And finally meeting Diego at the Bus Station was such a relief. I immediately got a great vibe from him. He was genuinely happy that I had come. He is the sort of gentleman that one rarely meets anymore. And YES, his IS actually THAT good looking. Google him… Yup, that’s not photoshop. His beauty is only matched by his lovely partner, and two perfect children! Arriving at the Inn at Mata Oritiz was like sauntering casually into a romantic western film in the 1950’s. The Inn is basic, pretty, well-kept and clean. It was built over 100 years ago, whitewashed adobe, with pretty shaded garden areas. Alma, the proprietress speaks not a word of English, but she is fluent in the universal language of hospitality. Her food was simply perfection. Each meal was made like it would have been for family; fresh and hearty. Unfortunately, the owners of the Inn were pretty lame on my last night (Not Alma, she remained awesome). Ill get to that later. Diego gave me a tour of the small town, of around 1000 people. It seemed even smaller, really. Even though I spoke no Spanish, and most of the people there spoke no English – I felt safe. It was such a small town I imagine everyone knew who I was and what I was doing there. There was another potter in town who was doing a class at the same time. I think that those students were staying in Cases Grandes. So here is a bit of history on the Mata Ortiz – according to Diego and a few other bits I picked up here and there. There are several books written about it. Two of which I bought before going, and neither of them did I read. So here is the Mata Ortiz story, according to me – and I could be totally wrong. One hundred and fifty years ago some folks moved to the beautiful river valley. Now this river only has running water for about a month out of each year, just during the rainy season. It rains something like 3 days a year, but its monsoon rains when they come. But the valley is slashed through with the verdant strip of green, the trees roots digging deep for the water that is there. In this forest of old willows is ten million birds. Their songs echoing off the rocky red mountains that flank this valley. Anyway… people moved here to escape the chaos of the pending revolution. That didn’t end up working out so well… as Chihuahua ended up playing a major role in the revolution, and was not spared any of the violence and upheaval. But just prior to the revolution families moved to the area, and built adobe homes out of the dirt and rocks that was their land. They noticed that there were quite a lot of pottery shards in their adobe. And then they started finding whole pots. Or bits and pieces that they could put back together into pots. By the 1950’s the collectors started coming and so did the archeologists. Many of the locals worked and learned with the archeologists. But they also learned a different skill… copying the ancient pottery so well that they could pass it off as artifacts. There are museums all over the world that has some of these fakes in their collection! 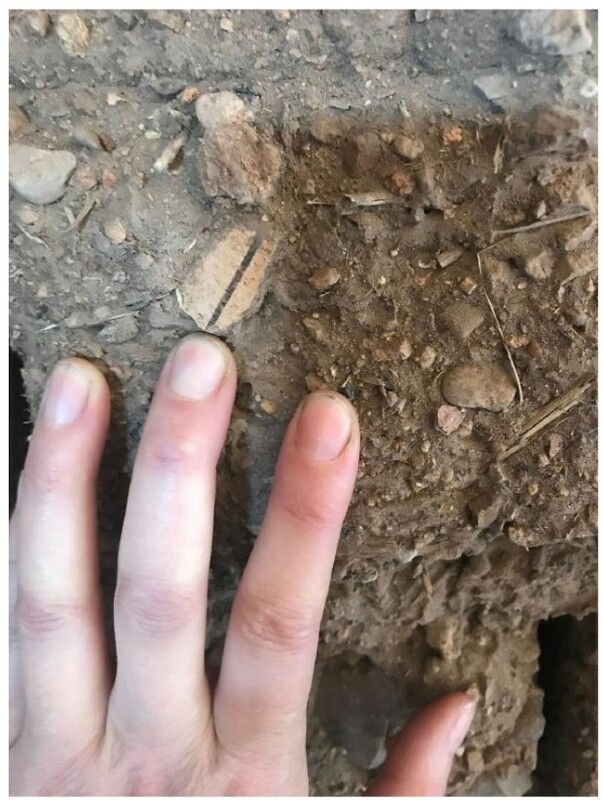 (Ancient pottery shard in the adobe walls of Diego’s childhood home) The Ancient people – dubbed the Paquime – had been gone for over 600 years. One generally accepted theory is that they moved northward and became the Pueblo people. Their systems of architecture, public infrastructure, and governments were all quite advanced. And their artwork was quite sophisticated. The Mexicans who moved in to the area hundreds of years later learned their techniques for making pottery through trial and error, and by using the materials at hand, the same materials used by the Paquime people. (And this is one reason why spotting a fake can be nearly impossible). 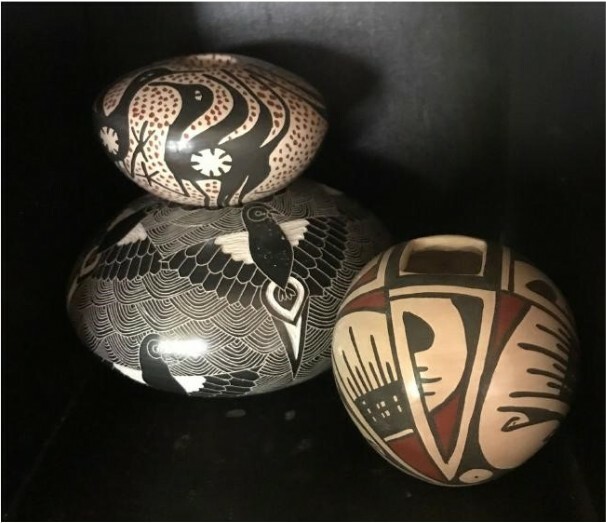 But after a few decades of ‘fakeing it’, a few of the Mata Ortiz potters started to make their own art – based off of the tradition, and with the same materials – but with a unique and contemporary eye. They began to sign their work. And sell to art collectors, not just artifact collectors. The bowl to the right is one of Diegos. Below are three small pieces I bought while in Mata Ortiz, each with a very different style.Next time I’ll tell you about the process of actually making this beautiful style of pottery. And perhaps I’ll tell you more about Alma’s amazing cooking! I hope you’re enjoying this account. I will try and post the next part before too long. Be sure to email me should you have any questions!